Opera Atelier opened their 30th anniversary season with their latest take on Lully’s 17th century masterpiece Armide. They’ve done the work before, the greatest opera you’ve never seen. Perhaps it isn’t performed as frequently as it deserves, but it is a colossal mystery in some ways, the styles of the period largely a matter of speculation & experiment for a company such as Opera Atelier. There is so much that’s new in this production that i wanted to think of it as Armide 2.0, as it it were a new version. Indeed I’d go so far as to say this feels like a breakthrough for Opera Atelier, not just a change in the approach to Armide but possibly a different pathway in everything we may see from them going forward. I sure hope so as I think it’s the best thing they’ve ever done. Colin Ainsworth (Renaud) and Peggy Kriha Dye (Armide), photo: Bruce Zinger. Let’s go back, to earlier productions to get the context. Lully has always been the promised land for Opera Atelier, an opera company that resembles a ballet company. Nobody integrated dance into opera like Lully, who was after all a part of the court of Louis XIV, that dancing king. If one reads too many history books one loses sight of the forest for the trees. But that’s what Opera Atelier used to do, captive of a notion of performance that wasn’t just historically informed, but at times tyrannized by a concern for accuracy bordering on fetish. Paintings were used as authorities, creating a precious and overly careful look that is still somewhat in evidence. The result was beautiful to be sure, but often at the expense of drama or even life. The French Tragédies lyriques are not segmented in the same way as Italian baroque opera. Theorists wrote about divertissements, in their identification of the supposed function of the dance, which is to say as a kind of release of tension within the opera’s dramaturgy. But this tension & release model probably errs in being reductive, missing the real possibilities of dance. The earlier Opera Atelier attempts at Lully –productions of Persée as well as earlier versions of Armide –were more rigid in their structuring. Dance was not integrated as fully into the work as what we saw tonight. Director Marshall Pynkoski, Conductor David Fallis and Choreographer Jeannette Lajeunesse Zingg between them have arrived at something much more organic & true to the text in the way that the music and text flow, with dance fully integrated into the story-telling. Sometimes it’s the members of the OA ballet , sometimes it’s the stars of the production moving with the music or even dancing. This is very different from the opera putting ballet as a kind of garnish onto the surface as a kind of decoration; the dancers and dance are fundamental to the musical and dramatic conversation. I couldn’t help thinking that Louis XIV would have approved of this seamless connection among the parts. There’s something more obvious that is different in this Armide, and it’s in the vocal interpretations. Again, it’s a departure from the fetish for beauty that has handcuffed this company for so long. Tonight we heard singers willing to make rough and angular sounds, so edgy as to be worthy of a 20th century opera, at times resembling speech or rap. The music wasn’t lost, but it was no longer a strait-jacket. As a result there was a whole new playfulness to the opera, a sense of possibilities, of experimentation. A whole new vista opens up for me, and i hope they see it too in their future productions. 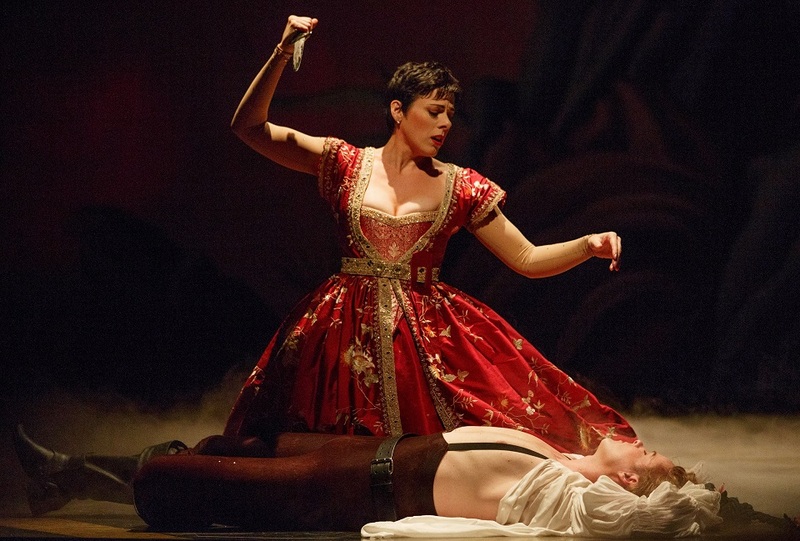 Armide (Peggy Kriha Dye) is tormented by her contrary impulses, unable to kill Renaud (Colin Ainsworth). Foremost in this regard was the title role as portrayed by Peggy Kriha Dye, who seemed to break out of the usual restrictions one perceives when seeing this company. Her expressive range was beyond that of any performer I’ve ever seen with OA, because of her willingness to undertake different sounds, a different set off assumptions. She took her character beyond the usual boundaries of the baroque sensibility that’s usually displayed by OA, to something very modern & disturbed, a genuine agony as she is tormented by her love, conflicted and at times seeming genuinely mad. Her lover Renaud, played by Colin Ainsworth, showed off a voice that continues to grow in size & expressiveness, at times bigger than we’ve ever heard him, yet at times very soft & subdued. Daniel Belcher’s take on La Haine (or hate), called for wild & flamboyant sounds very much in character, unlike the prettier approach we’ve heard in previous OA productions of this opera. We were in a realm of the grotesque, an explosion of sound that was suitably over-the-top. The confrontation of Stephen Hegedus’s Hidraot with Armide is much angrier and more passionate (fully committed regardless of whether the voice is pretty) than the subdued interpretations OA have offered in the past. The emotional range of the production is beyond anything we’ve seen from this company before, less of the obsession with beauty and as a result, a fluid drama encompassing everything from comedy to possible tragedy. There’s a great deal to admire in this production, from the baroque version of blondes having more fun (Carla Huhtanen & Meghan Lindsay second guessing super-serious Armide as they encourage her to surrender to her desires), to the comical byplay of the two chevaliers (Olivier Laquerre and Aaron Ferguson). Opera Atelier’s use of the ballet is the most perfect integration of dance into an opera I’ve yet seen, often a key part of the story-telling. 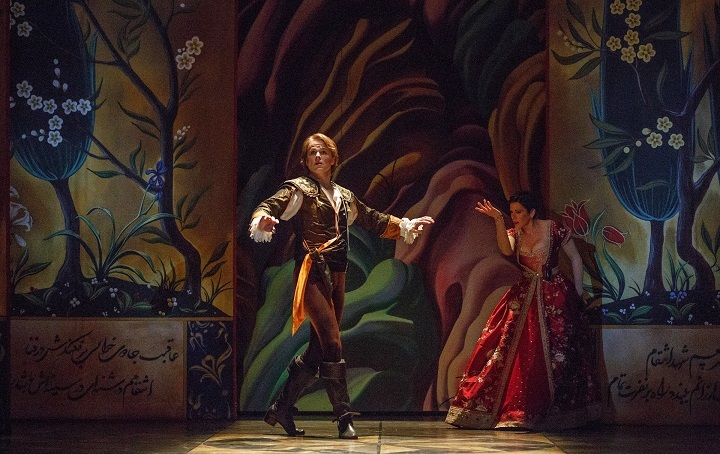 Opera Atelier will be taking Armide to Europe, but for now, see it at Toronto’s Elgin Theatre, where Armide runs until October 31st. Your review is excellent. You tell me almost to perfection how the piece was performed but I must reflect that your view was on opening night, and that from there on, things may have changed. The performance I saw on October 24 was, I felt, a rehearsal for the ensemble’s big gig at Versailles. I don’t think it much affected the performances of the singers (brava, Peggy Kriha Dye) or the male dancers, but I felt some of the female dancers were rather precious and careless and that the orchestra was no better than competent. The chorus was admirable. Whether the dance was as fully integrated into the opera as you say it was thus becomes moot: if it doesn’t reflect the same quality of performance as the edgier rest, then it hasn’t succeeded, and it did not for me. Dress rehearsals can be very enjoyable and satisfying, but that is all we got here. It will likely be a triumph at Versailles, and we, the Toronto audience, will have played our role, however unintended. Opera Atelier owes us big time, and much as I dearly cherish them, I am looking to a big payback with Mozart in April … and perhaps a bit more respect in the future. You have a very good point, in questioning how well the dance is integrated. I’ve seen earlier versions of this production and while i think it’s more integrated than before, the dance is still of the same kind. Our modern expectation of unity owes a lot to Mr Wagner (and his “Gesamtkunstwerk”) and what he has taught us to expect in so many media: and so perhaps this isn’t a fair expectation. Was my praise overly fulsome? Perhaps. But even so i was watching a performance that seemed to be a quantum leap beyond what i’d seen before. I noticed on entering the theatre a large poster that reproduced Richard Ouzounian’s glowing review in the Globe. However, this was for the 2012 production. Unless one looked for the dateline, one could be forgiven for thinking it was a review of the current production, since so much remains the same in terms of the performers and even the costume. It would have been more forthright to state explicitly that the review was of what we got last time and not necessarily of what to expect this time. As you suggest, there were changes between the productions.